It was not always the case. 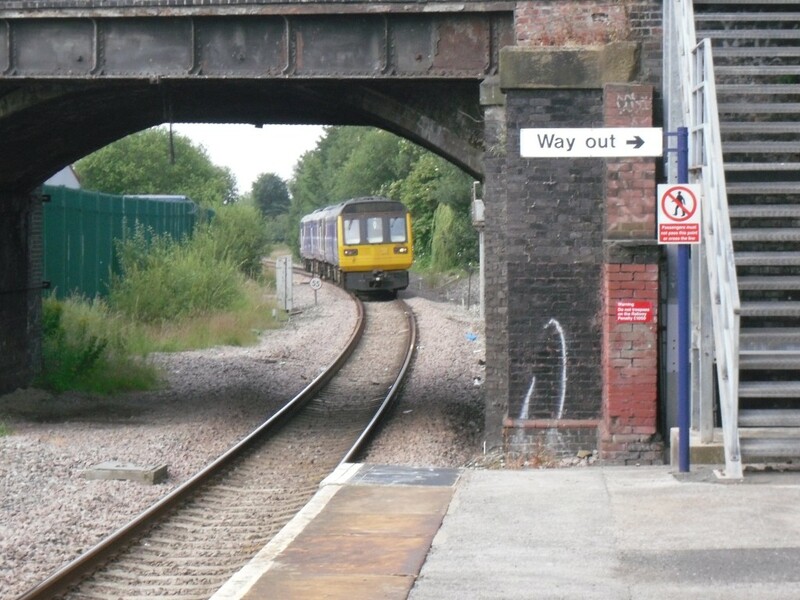 Until 1989, the line had an hourly service which provided a useful link for passengers from the Stockport area who wished to reach destinations on the trans-Pennine route. At that time, these services ran via Manchester Victoria, and to travel from Stockport via Manchester would have required passengers to cross the city from Piccadilly – an awkward task in those pre-Metrolink days. 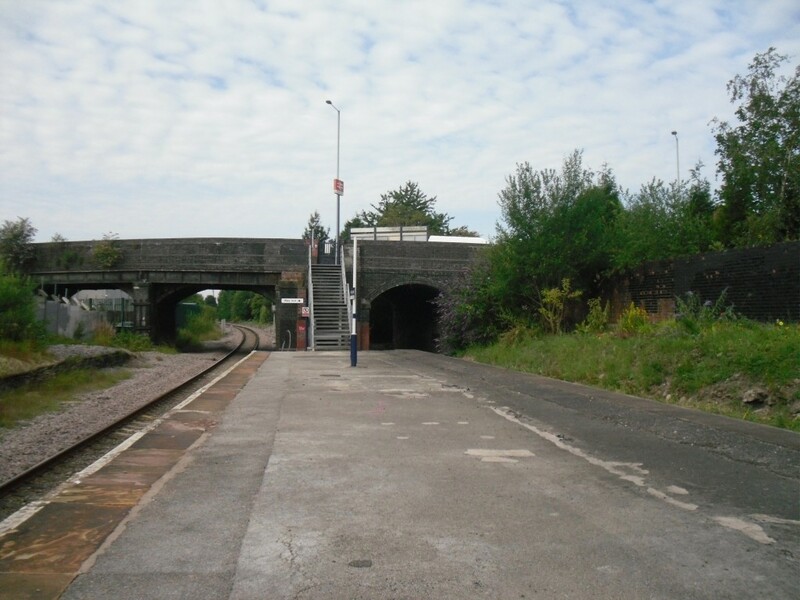 However, the Pennine services were subsequently rerouted to use Manchester Piccadilly, removing the main reason for the line’s continued existence. 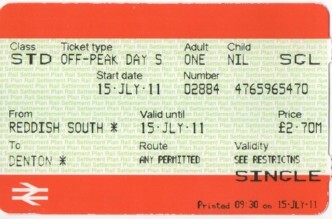 British Rail quickly ran the service down and by the mid-1990s the once a week service was well-established. Bizarrely, this token service was written into the franchise specification for the privatised operators, meaning that North Western Trains, First North Western and now Northern Rail have been obliged to run this useless service, and the situation looks likely to continue for the foreseeable future. Thanks to the internet, the notoriety of the service has spread in recent years, to the point where rail enthusiasts now arrange meets on the train, often followed up with a visit to the Real Ale buffet at Stalybridge station. What better way to start my blog than with a ride on the “Flying Dentonian”, as one online wag called it? Planning my visit needed military-style precision. I have set a rule that for my visit to “count” I must arrive at or depart from the station by train. 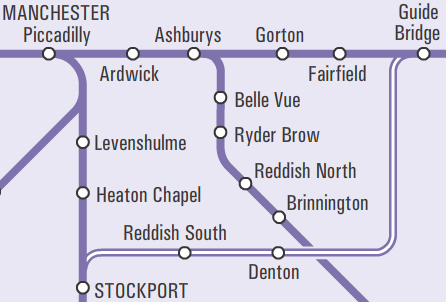 Since Reddish South and Denton are linked by precisely one train, I would have to reach Reddish by other means in order to travel between the stations on the Parliamentary train. It’s hard to find any written acknowledgement of this service’s existence, but it does appear on page 16 of Network Rail Table 78. Reddish South and Denton, however, are mentioned only in a footnote at the bottom of the page. 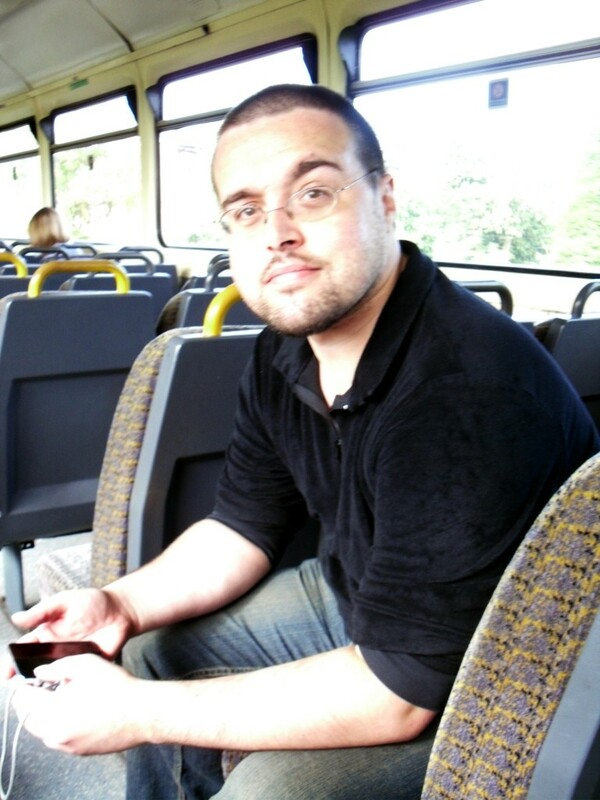 I decided that the best option would be to get the bus from Manchester to Reddish and then back again from Denton. Luckily Transport Direct was forthcoming with the bus timetables I needed (how did people plan journeys before the Web existed?) 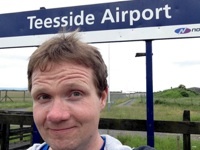 and, although an early start would be needed, I was confident that I could easily bag the stations. Of course, it could all go wrong very easily, so I was pleased to have my friend Scott with me on this, my first journey. If I missed the train, at least I would have someone to talk to while I waited seven days for the next one. The journey from Manchester was simple enough and despite heavy traffic we arrived at Reddish South with twenty minutes to spare. The station entrance is located on the main road, but I did my best to pose on the narrow pavement as Scott snapped a picture of me in front of the station sign. The timetable information poster at the station (shown at the top of this blog) apologetically listed the single train. 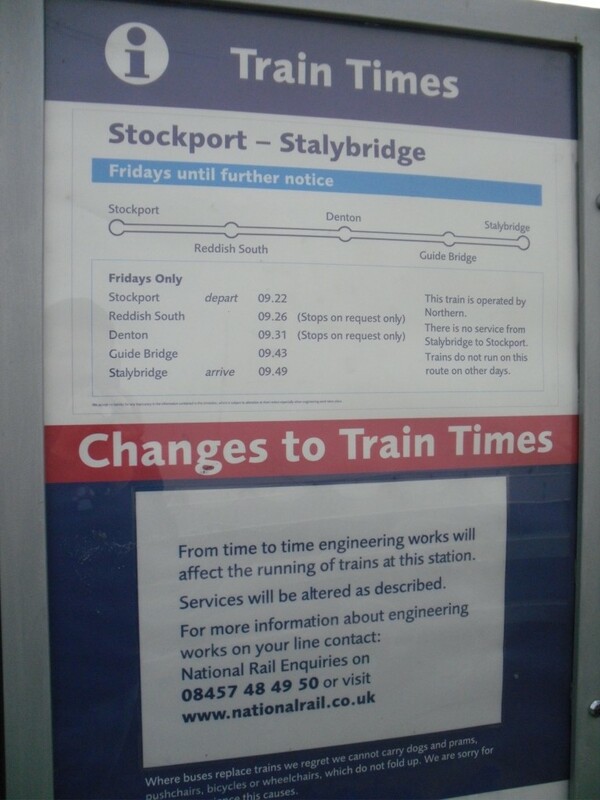 “There is no service from Stalybridge to Stockport,” it warned, adding: “Trains do not run on this route on other days.” It didn’t say, “now please go away,” but it might as well have. 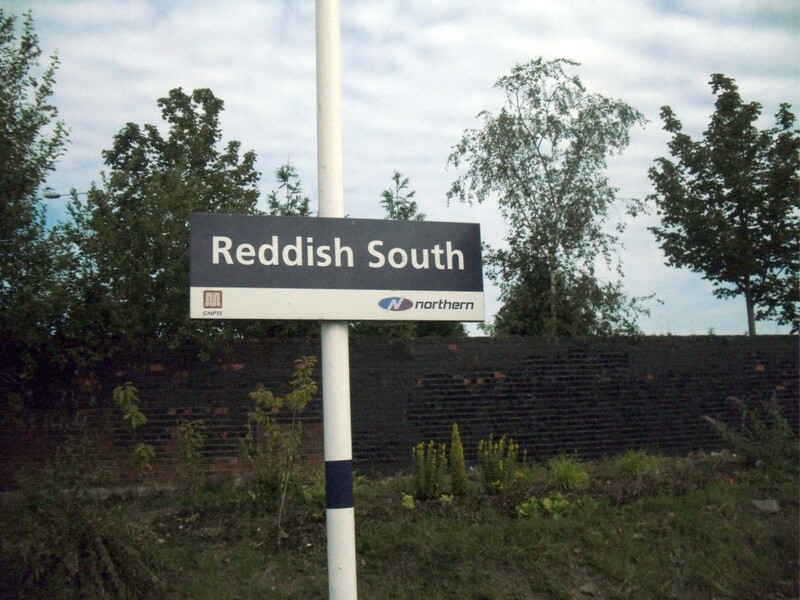 The sole note of optimism came from the Friends of Reddish South Station, who are tirelessly campaigning for a regular service to be reintroduced. They even have their own community poster, apparently paid for by GMPTE, although the cynical part of me wonders if the PTE simply did this for some PR brownie points. 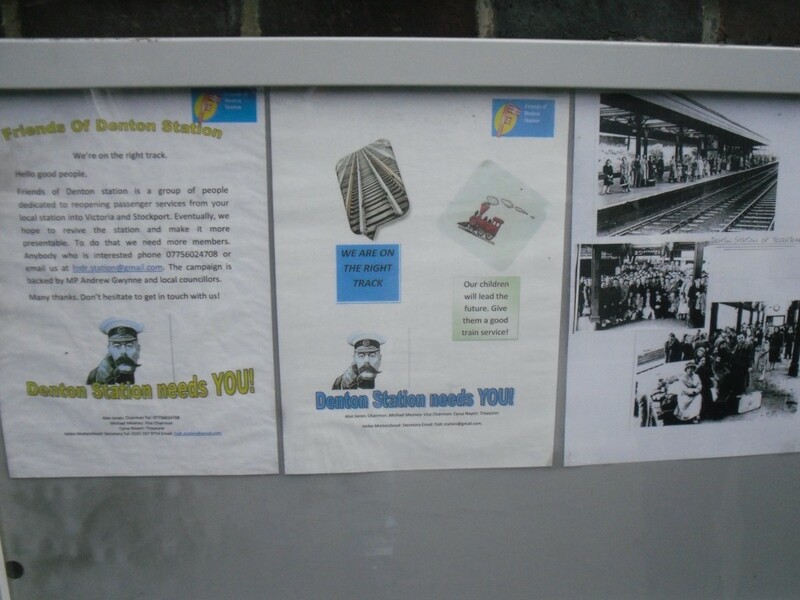 The friends are doing a great job of rallying people to their cause, drawing attention to the special trains which use the station occasionally and keeping the station tidy. They even organise occasional folk music events on the train to attract passengers. Their eventual goal is to restore a full service through the station to Manchester. They have an uphill struggle, as the powers-that-be do not seem too enthusiastic about adding to the current service, but good luck to them. There was plenty of time while we waited for the train to sample the ambience, such as it was. A set of bare metal steps led down from street level to the single platform. There were a couple of nameboards, an information board (a new feature again courtesy of the FoRSS lobbying) and… that was it. No buildings, no seats, no waiting shelter, not even lights. Stations between trains are often quiet, lonely places. When the gap between trains is a week, however, it becomes downright eerie. 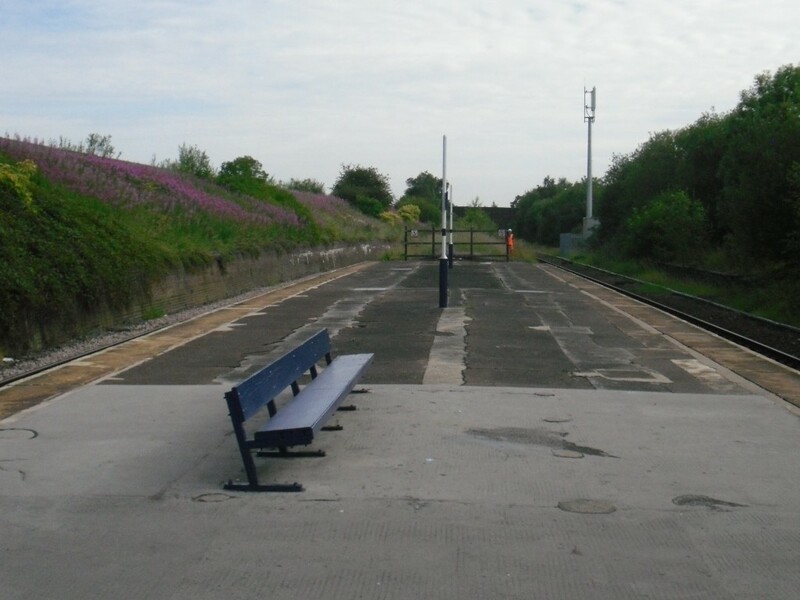 It feels wrong for a station to be deserted like this – especially here, surrounded by Manchester suburbia. As we snapped photos, I was surprised to hear a train approaching. It was 9.15 and the service was not due for another ten minutes. I turned around and saw a Pacer approaching. Despite frantic arm waving from me (the station is a request stop) it passed straight through. I panicked briefly, but then remembered that, although the line receives a paltry passenger service, it is regularly used by empty stock movements. I prayed for the service train to arrive soon, as the driver of the ECS would surely be on his radio to report a nutter on the line. A few minutes later, we heard another train approaching. This one was clearly slowing for the station stop and the driver tooted an acknowledgment to our hand signal. This was the reason for our trip: the 0926 (Fridays Only) service from Reddish South. Extravagantly it was formed of 4 coaches. As the train drew into the platform, it was clear that we would not be alone. Passengers stared out of the windows at us, surprised and delighted by our presence. They were an assortment of rail enthusiasts, all on this train for the same reason we were – so they could say they’d done it. Our fellow geeks did not introduce themselves to us, nor we them, but I did feel an unspoken camaraderie. The train guard, who seemed understandably surprised by our presence at the station, went back into his rear cab to get his ticket machine. We bought Off Peak Day Singles to Denton, for the princely sum of £2.70 each, then settled back to enjoy the five minute journey. We proceeded at a leisurely pace (well-maintained track not being a priority on this stretch of line, the speed limits are decidedly low). A brief moment of excitement came when a sudden, unexplained emergency brake application was made and we came screeching to a halt briefly. Scott was enjoying the experience as much as me. See how happy he looks here! A few minutes later we rolled into the other “limited service” stop – Denton. A few of the other rail enthusiasts got out and grabbed a photo of the station sign, before jumping back onto the train. The guard waited patiently while all this was happening; I got the impression that he’d seen it all before. Scott and I were the only passengers to actually alight at Denton. 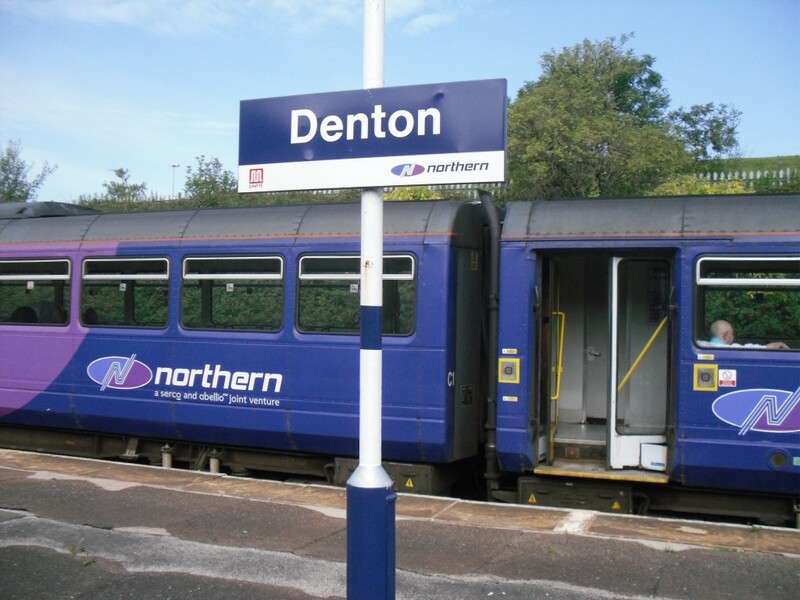 A solitary person boarded as we got off, cheerily shouting “Welcome to Denton!” at us. We grabbed photos of the train, then watched as it accelerated away towards the relative civilisation of Guide Bridge. The station fell silent, ready for another seven day slumber before the next train. 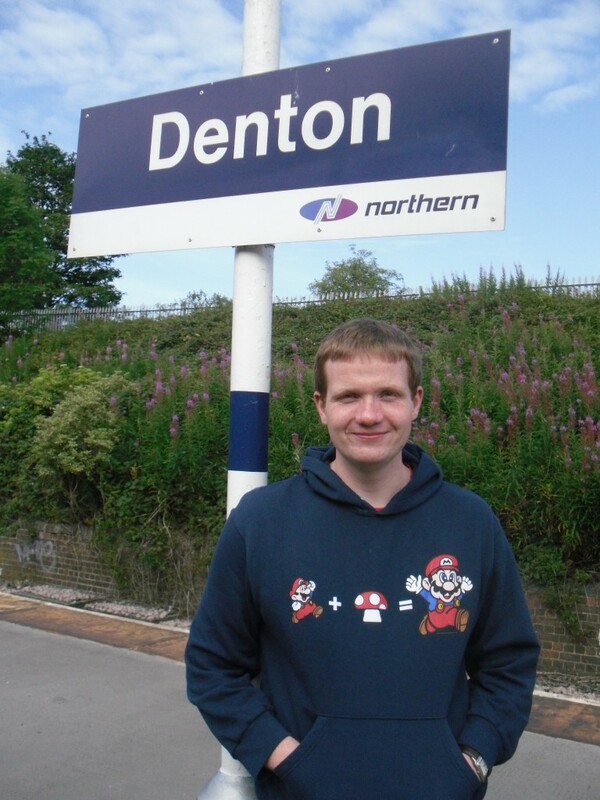 Denton is luxurious compared to Reddish South – TWO platforms (although one is never used) and, most excitingly of all, a bench! Given the big gap between train services, it’s a good idea to have somewhere to rest. We became aware of a railway worker in an orange high-visibility jacket regarding us with suspicion, but nevertheless loitered on the platform for a good few minutes to get some photos. 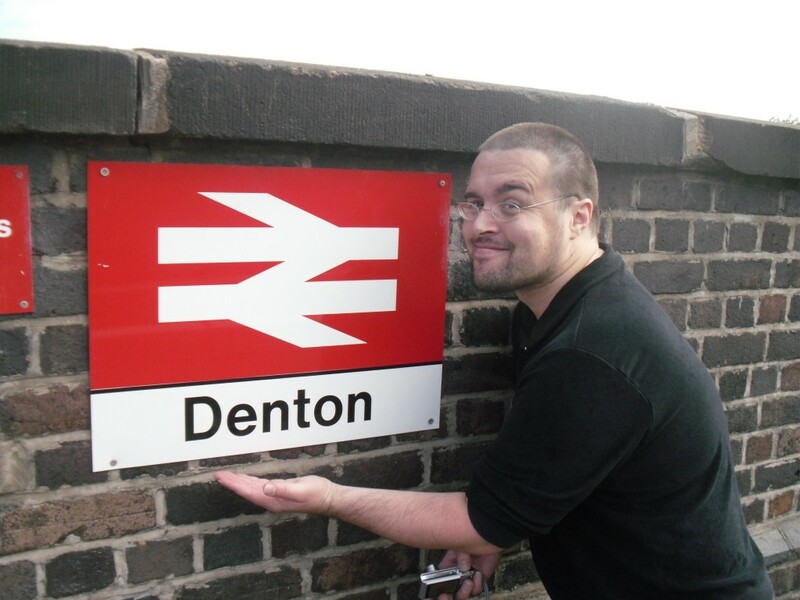 Denton station itself is located in a slightly depressing industrial area, isolated from much of the town by the M67 motorway which passes over the railway immediately south of the station. I was pleased, however, to see that this station too had its own Friends Group with a notice board at the station entrance. The photos of the station in steam days were a nice touch. We were both amused by the group’s tagline for the poster: “Our children will lead the future. Give them a good train service!” – as Scott pointed out, it sounds like a rejected first draft of a Whitney Houston song. Nevertheless, their heart is in the right place and it’s a campaign that should be supported. What future does this service have? As things stand, not much. Network Rail in 2007 proposed closure of the line and its stations, but reprieved them following representations from local authorities. However, the service level remains stubbornly fixed at one train per week and there is no sign of that changing. One apparently insurmountable problem is that there is no capacity to run extra services over the junction with the main line at Stockport. For now, at least, it looks like this line is destined to remain a novelty, of interest mainly to rail enthusiasts and local councillors looking for a cause to champion. 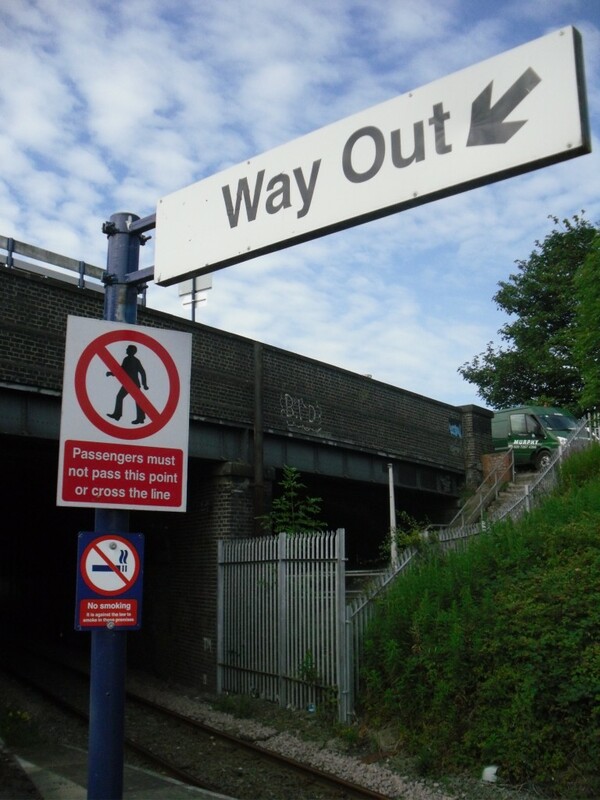 It also serves as a vital reminder to anyone, anywhere, who dares to take their local rail service for granted; while it may not be closed, it can be cut to the point of uselessness at any time without notice. Scott also wrote up the day and his version of events can be found here. Great idea for a blog, Robert, and a great tale to kick things off. Look forward to reading more of your travels. Fantastic blog! 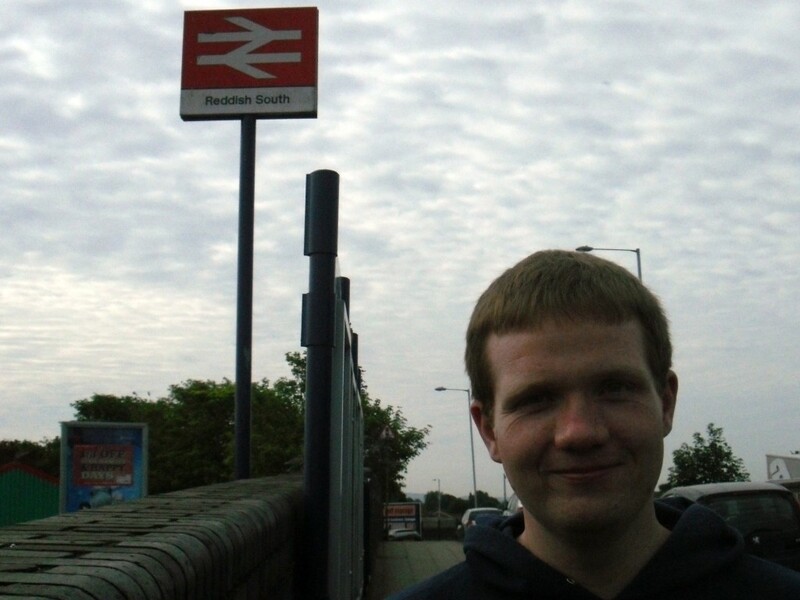 Is Acton Bridge on your list of stations to visit? I think the service is restricted enough to qualify, so yes! As it happens, Scott already had it loaded up on his iPod for my listening pleasure! The next “FOLK TRAIN” to Stalybridge buffet bar will be just before Christmas. 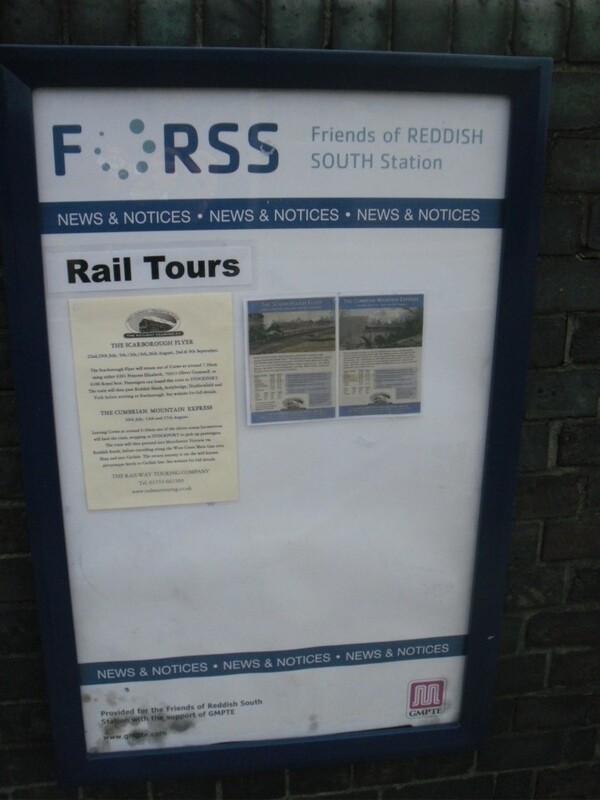 See the “Friends of Reddish South Station ” web site for more details ! FORSS.